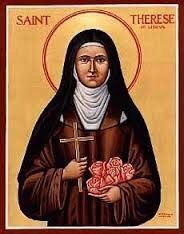 Repost of this podcast on St Therese’s feast day. As part of our ongoing series on saints, in this episode, Pamela and I discuss Saint Thérèse of Lisieux. Also known as The Little Flower, St Thérèse is a beloved role model for all Christians. This entry was posted in Uncategorized. Tagged Catholic podcast, Catholicism, Podcast, Saints.